Sometimes the evil lurks in what’s supposed to be Word 2016’s main repository of sanity: the Normal template file. To fix the Normal template, you must delete it (or rename it) and then Word automatically builds a new, proper Normal template. If you rebuild the Normal template, you’re removing any customizations you’ve added, macros you’ve created, or default settings you’ve modified. On the other hand, those changes may be causing your problem, so it’s time for a fix. Press Win+E to summon a File Explorer window. Click the Address box to select whatever name appears there. Press the Delete key to clear the Address box. As you start typing AppData, you see hints appear below your typing. These hints help to direct you and confirm that you’re on the right track. 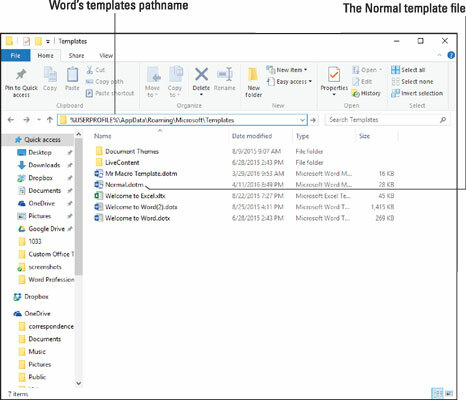 Eventually, you see the Templates folder. Right-click on the Normal.dotm file. Choose the Rename command from the shortcut menu. Edit the name to Normal-old.dotm or Normal-old. Press Enter to lock in the new name. In the File Explorer window, you see the rebuilt Normal.dotm file. This trick may or may not work, and it does remove any modifications that you’ve made to Word. To restore the original Normal.dotm file, quit Word and rename the file back to Normal.dotm or Normal. Word stores its templates in the folder referenced by the pathname you type in Step 5. This location holds true for Word 16 and Office 365. Earlier versions of Word stored the template files in a different location. The %USERPROFILE% thing is a Windows environment variable. It represents your account’s home folder on the PC’s primary storage device.